Bandung has become a destination of culinary for some people. They want to taste something different knowing that Bandung has many various kind of recipes and taste. I as a pure Bandung citizen also love the culinare of Bandung knowing that the people always produces something creatively. Moreover, since Bandung has a lot of tourism, the people have produced many west foods with an original taste, such as Steak Ranjang. What I love right now from the culinare of Bandung is that I found something tasty and has a cheap prize. My friends introduce me the Steak Ranjang, or Bed Steak if we translate it into English. It is located in Jl. Dipati Ukur across the gas station. The place is small and simple. Do not have any special decoration. Even though the place is small, but it still attracts many people to eat there since it is in strategic area, cheap and unique. Jalan Dipati Ukur is located near the “Monumen Pahlawan”. Moreover along Jalan Dipati Ukur there are many universities, such as Universitas Telekomunikasi, Sekolah Tinggi Harapan Bangsa and Universitas Padjajaran. Since there are many universities there, people try to open the businesses. Many cafes and stores are opened there include the Steak Ranjang. If you curious where is it, just go to Jalan Dipatiukur and find the gas station. Steak Ranjang is acrossed the gas station. It really is eassy to reach and strategic, because there are many angkot which pass that street. If you have found the place, try to eat there. You do not have to bring much money in your pocket, because the price of the steak is really cheap. They use the price that are acceptable for the students. Therefore the price of the steak is not more than Rp.30.000. In fact, with only Rp. 30.000 you can eat the steak with the drink. Furthermore, I guarantee that you can feel satisfied after eat the steak. 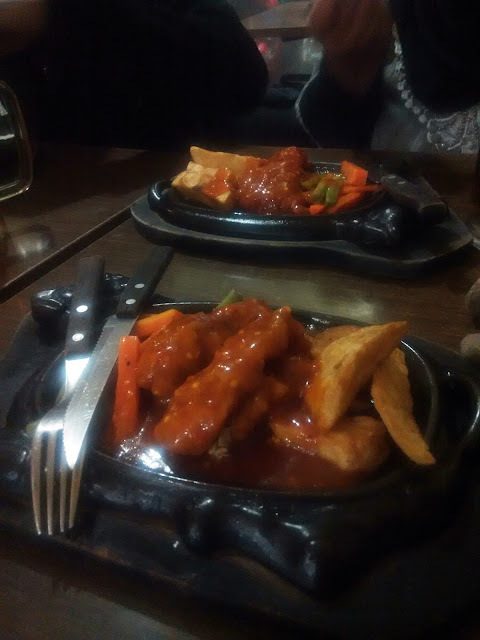 If you want to find something different with a western style of food, try to eat in Steak Ranjang in Jalan Dipati Ukur. It is tasty, cheap and unique. The taste is fit for every tongue. Since it is located near my workplace, I usually eat there if I want to eat steak. If you are steak lover and want to taste something new, try to go to Steak Ranjang, a cheap steak with a high taste. Thank you sist.. Finally... I'll go eat there ! Seems cool place with the delicious foods... OK. Noted. May be the restaurant has to put NSFW label or something on it's banner..